Domino was uncooperative today. Every time I aimed the camera in her direction she immediately perked up and walked straight toward it. She thinks it’s a giant eye, and she’s mesmerized by eyes. If I want her to come to me, she resolutely ignores everything I do1 unless I get down on the floor and look at her from eye level. Then she immediately trots over. This is actually kind of fun except when I want to take a picture of her. 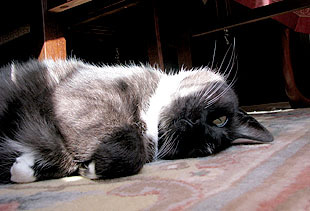 So instead of a nice spring-ish garden picture, you get one I took yesterday as she was rolling over in her afternoon patch of sunshine. 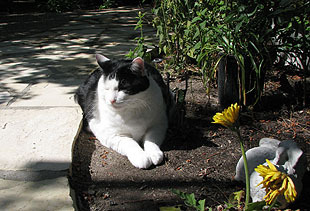 Inkblot, however, who is oblivious to everything,1 remained right where he was when I went out in the garden today. So he gets a nice spring-ish garden picture. If the weather cooperates in your neck of the woods, I hope you get to spend some time in your garden too. 1Other than opening a can of cat food, of course.